The company is named after Oleg Antonov - one of the most outstanding and renowed designers in the history of aviation. He held numerous awards and titles from different countries. His portrait was placed in the Hall of Fame of the International Aerospace Museum in the USA. Antonov founded his enterprise in 1946 and headed it until 1984. He started the basic traditions which his successors keep today. The first aircraft marked with AN logo took off in 1947. It was the multipurpose biplane the Antonov-2 - the only aircraft in the world in serial production for more that 60 years. Each aircraft that followed - the Antonov-8 cargo plane, the Antonov-10 passenger plane, and the Antonov-12 military-transport plane - marked a new stage in the history of Soviet and world aviation. 1959 is the year of maiden flight of the Antonov-24 - the regional passenger plane that became "a work horse" of many airlines accross the world. It became also a basis for an exclusively successful family - the Antonov-26 freighter, the Antonov-30 aerial photographer, and the Antonov-32 intended for operation from/to mountain airfields. 1965 saw the debut of the world's first wide-body cargo plane the Antonov-22 Antaeus. 1977 started the history of the "flying 4x4" family - the Antonov-72 and Antonov-74. The best creations of the enterprise are the Antonov-124 Ruslan and the Antonov-225 Mriya that remain the world's largest aircraft and holders of 270 world records. They are widely used as cargo carriers throughout the world. At the turn of the centiry, ANTONOV created new competitive aircraft meeting stringent international standards - passenger planes the Antonov-38, Antonov-140 covering the entire spectrum of services provided by regional airlines and, of course, the military STOL transport Antonov-70, which is able to provide higher mobility level of military foces and to perform various missions in emergency situations. 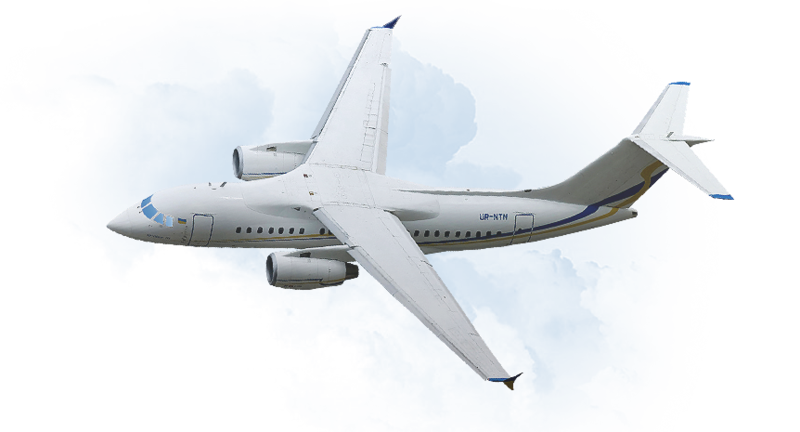 Nowadays, one of the most advanced international Antonov program's is development of new generation of regional jets family Antonov-148/158. The new AN-148 regional jet meets all of these and other future requirements. In order to satisfy the requests of various airlines a whole family of aircraft offering different passenger capacity, flight range and take off weight was designed. Commercial operation of AN-148-100 aircraft began in June, 2009. AN-24 (designed in 1959, 48 passengers) - main regional airplane in the USSR and other countries for 30 years. AN-28 (designed in 1973, 19 passengers) operated on local air routes of European and Latin-American countries. AN-38-100 (designed in 1994, 27 passengers) operated in Russia and countries of South East Asia. AN-140-100 (designed in 1997, 52 passengers) - high comfort level and profitability in operation. AN-74TK-200 and AN-74TK-300 (designed in 2001, 52-56 passengers) meet all the modern requirements.